Too many times have I seen the same questions asked again and again : "I can't watch old replays", "how do I add a server", "I need a NoCD launcher", etc... Every time, the same answers are given and it's becoming to be tiring. REMINDER : most of these tools can be found in the Downloads section of http://www.bwprogrammers.com (except for the Map-making ones). I'm not making some advertisement for BWP but I find it quite convenient to have a place for all this kind of tools. REMINDER #2 : most (if not all) of these tools run on PC, not Mac. Sorry guys ! Description : the official patches by Blizzard. It does not contain patches older than 1.07. Sorry, but this is illegal. Blizzard didn't use that kind of protection for nothing. You might want to take look at Daemon Tools which is a utility that can emulate a CD from an ISO image. 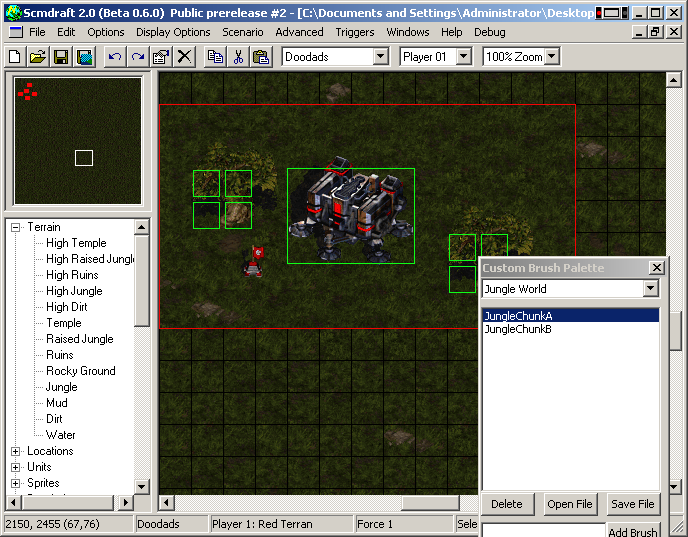 Description : SC Extension is a launcher that allows plug-ins do various features INSIDE StarCraft. The most famous plug-in was PenguinPlug (PP) but it wasn't updated for 1.15 because of some issues with Blizzard (don't know the details). See a list of various plug-ins somewhere below in this post. WARNING #2 : it doesn't seem that Mini SC works on B.net (which is quite understandable given the type of protection Blizzard put into place in 1.14). Thanks to Vin[MBL] for the info. Description : nice simple tool that lets you add/remove Battle.net servers without messing with your registry manually. You can also export/import the list to/from an external file, making your life easier when you need to reinstall your entire system. Description : BWChart is the tool that created the notion of APM (Actions Per Minute). It is a graphical tool that draws charts from replays, helping you to analyze it : what kind of action was taken and when, number of units created, hotkeys, etc... It even has Build Orders. There's also a file browser for your replays but since BWChart wasn't updated since October 2003, it is unable to find the correct version for replays older than 1.12. Must have anyway. Custom tooltips, diplaying APM, players names, map name, game length, etc... for replays, or map name, size and tileset for maps. Extracts maps from replays and saves them in your maps directory in 2 clicks. Also works with drag-and-drop if you want. Allows you to see text that was typed by players for RWT. Adds new columns in the "Details" view (map name, game version, game type, game name, etc...) so that you can actually sort your replays using these criterias. Description : This is where EAPM (for Effective APM) comes from. The author used an algorithm of his own to remove so-called useless actions like hotkey spamming, right-click spamming, etc... Arguable but useful anyway. Description : a third-party map editor for StarCraft, ScmDraft allows you to do much more advanced stuff than StarEdit. I do believe it is used by the guys at Mapdori.com to make the pro maps. Description : another third-party map editor. Looks like it was very popular at some point in time, I don't know how much it's used nowadays. Version : 2.5 ; apparently there's a patch to 2.6 but it appears to be somewhat buggy. Description : same as above, except that this is not an editor in itself. It mods the original StarEdit editor. Description : one of the most famous (and used) map protector out there. Again, I believe the map-makers at Mapdori.com use it. Description : nice tool that allows you to generate a StarCraft map from a picture Please see pheer's thread for a guided tour ! Description : this is a compilation I've made of all existing pro maps made by Mapdori.com. It might contain errors or ommit some maps in which case don't hesitate to tell me and I'll update the pack as soon as I can. Description : Allows you to set a minimum APM and a sound to play ; whenever it detects your APM as being below that amount, the sound will be played. Description : Allows you to play StarCraft in a 640x480 window on your desktop rather than full screen. You need to install BWLauncher in order to use it. Description : PvPGN lets you install and configure a private server for Blizzard games. It supports various games like StarCraft, Warcraft 3, Diablo 2. It's quite tedious to configure but very customizable. Description : players have always complained about the original AI. Therefore, Entropy (aka Physician on most SC forums) tried to enhance it using some scripts of his own. He was helped in this task by Bajadulce and it appears that the AI is now quite competitive... give it a try ! Homepage (in German) You can also check out BWChat's official topic on TL.net for more info ! Description : BWChat is a StarCraft Broodwar Chat on your desktop. You run Broodwar, join Battle.net - and then run BWChat. Description : SC-CD Key changer is the saviour of all our SC Cd's. The Program offers the ability to change your cd key without having to re-install Starcraft. Description : External application that displays your APM in real time when you play SC. Description : Allows you to play StarCraft in a 640x480 window on your desktop rather than full screen. How it works : unzip the whole package somewhere and then create a shortcut (on your desktop or somewhere else) that will look like this : "PATH TO DxWnd.exe" "PATH TO starcraft.exe" "PATH TO Starcraft.dxw". Example (on my computer) : "C:/DL/Drivers et installs/Jeux/DxWnd/DxWnd.exe" "I:/Starcraft/starcraft.exe" "C:/DL/Drivers et installs/Jeux/DxWnd/Starcraft.dxw"
Description : (from Physician's GG.net news post) The program simulates an abstract StarCraft:Broodwar environment and calculates the time a certain build order needs. By comparing different build orders, randomly changing them and taking the best build order for the next generation, the build order is improved step by step. Description : If you ever get sick of typing your password every time you log in to Battle.net, then this program is for you. Battle.net Auto Login automatically logs you in to Battle.net with the nickname and password you specify. Description : If you like to follow your friends as they join games, you probably get sick of copying the game name, character by character, into the join game box. With this program, whenever you see the familiar "Your friend (blank) joined..." message, all you have to do is right click. Description : WARNING This program is outdated and won't work with StarCraft > 1.11. Basically, the idea was that people could comment a replay and this program will record the audio as MP3 directly inside the replay. An alternative for newer versions consists in recording your comments using some dedicated software like Audacity and play the audio separately using Winamp or other MP3 players while the replay is running in SC. Phew... I finally come to the end of this post. Kinda boring stuff but I hope it helped (and will help) people Of course, I will edit this post as soon as possible if there are errors to be fixed, tools to add, etc... As you can see, the list is far from being exhaustive but I tried to enumerate the most common and useful tools. I'll try to add a "How do I..." section either in this post or in the post below ; for now, it's almost 3 AM here so I think I'm gonna go to bed :D Don't hesitate to post any (constructive) suggestion or remark ; I'll answer whenever I can. Removed links and references pointing to StarEdit.net because it's down. Minor fixes here and there to update with the release of patch 1.15.
oO Taiche ur one of the authors of Rexplorer?? have u ever wondered what all that stuff means? why there's so many additional stuff & applications? patching with this works on bnet???? Doubt it, JCA is the one who coded the original software and he's quit SC for about 1 year. Maybe if he releases the source code, who knows. What do you mean ? Since 1.14, Battle.net doesn't accept any other version than 1.14, so any modified exe or old patch won't work, I guess. heyhey, gj, hopefully get a feature. and that other program that allows one to modify b.o.s, ill try to get the link. how is no cd launcher illegal if they have it on wgt launcher? live long and prosper taiche! I guestimate that not only will this thread content keep growing, this featured thread will go over 20,000 reads with time. Yeah, I don't think it does. Blizzard did all they could to prevent 3rd-party launchers (except SC Extension, IIRC). And yeah, someone patch the RWA software. I miss making them. I found them to be very helpful. Amazing. I was really expecting a no-cd launcher, but still, nonetheless, awesome. wait so when u want to watch a replay...how do you know what version it was played as? does bwchart tell u the version?